code reviews = quality code. Review code, discuss changes, share knowledge, and identify defects with Crucible’s flexible review workflow. Its code review made easy for Subversion, CVS, Perforce, and more. Codeplex provides a complete solution for team system code reviews, and this tool and has become very popular with programmers. This code review tool uses the benefits of team system for reducing waste. Barkeep is a fast, fun way to review code. Engineering organizations can use it to keep the bar high. Barkeep is standalone software that you host. Once it’s set up, you can use it to track and code review any number of git repos available on the internet. It’s designed to be easy to run on Ubuntu. Review Assistant is a code review plugin for Visual Studio. This code review tool helps you to create review requests and respond to them without leaving Visual Studio. Review Assistant supports TFS, Subversion, Git, Mercurial, and Perforce. Simple setup: up and running in 5 minutes. Code Review Tool allows team members to review code collaboratively in an easy and efficient manner by removing most of the overhead associated with regular formal code inspections. It provides all the benefits of formal code inspections and requires considerably less effort and time compared to formal code inspections. It supports both formal and lightweight code review processes. Malevich is a web-based, point-and-click code review system designed for use by individuals and small teams. Its goal is making the cost of a comment as close to zero as possible: easy commenting encourages thorough code reviews. Reviewing code in Malevich is easy indeed. A reviewer can see both the original as well as the new revision of a file in a browser. To comment on a line of code, he or she simply clicks on that line, and starts typing. Submitting comments makes them visible to the person who requested the code review, as well as to all other reviewers. Veracode is the world’s best automated, on-demand, application security testing and code review solution. Founded by experts from security companies such as Guardent, Symantec, @stake, and VeriSign, and built on a Software-as-a-Service model – Veracode solutions deliver application security and automated code review services for enterprises that want to cost-efficiently test software security by identifying flaws in applications. Veracode helps developers create secure software by scanning compiled code (also called “binary” or “byte” code) instead of source code. 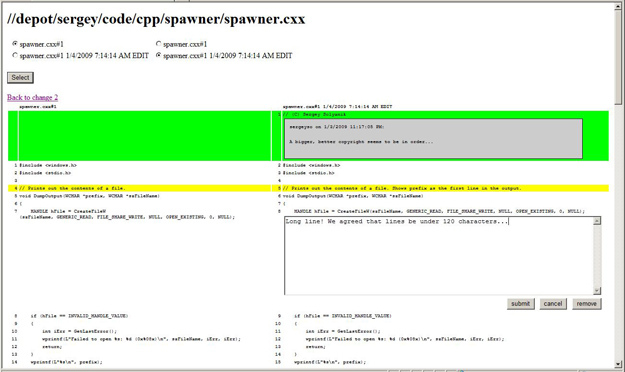 Codifferous can be described as one of the code review tools which is used by busy software developers. Once your code is imported from BitBucket or Github, the software reads the code in a jiffy.